Vayots Dzor (Armenian: Վայոց Ձոր, Armenian pronunciation: [vɑjˌɔt͡sʰ ˈd͡zɔɾ]), is a province of Armenia. It lies at the southeastern end of the country, bordering the Nakhichevan exclave of Azerbaijan form the west and the Shahumyan Region of the Nagorno-Karabakh Republic from the east. It covers an area of 2,308 km². With a population of only 53,230 (2002 census), it is the most sparsely populated province in the country. The capital and largest city of the province is the town of Yeghegnadzor. 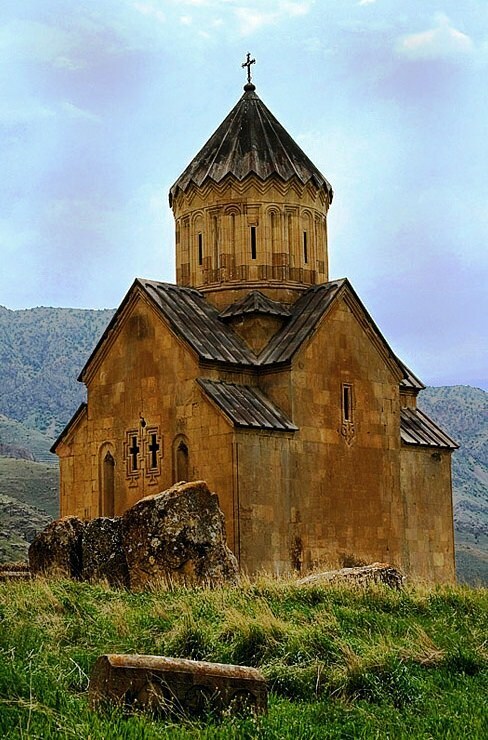 The province is home to many ancient landmarks and tourist attractions in Armenia including the Areni-1 cave complex and Areni-1 winery of the Chalcolithic period, the 8th-century Tanadivank monastery, the 10th-century Smbataberd fortress, and the 13th-century Noravank monastery. 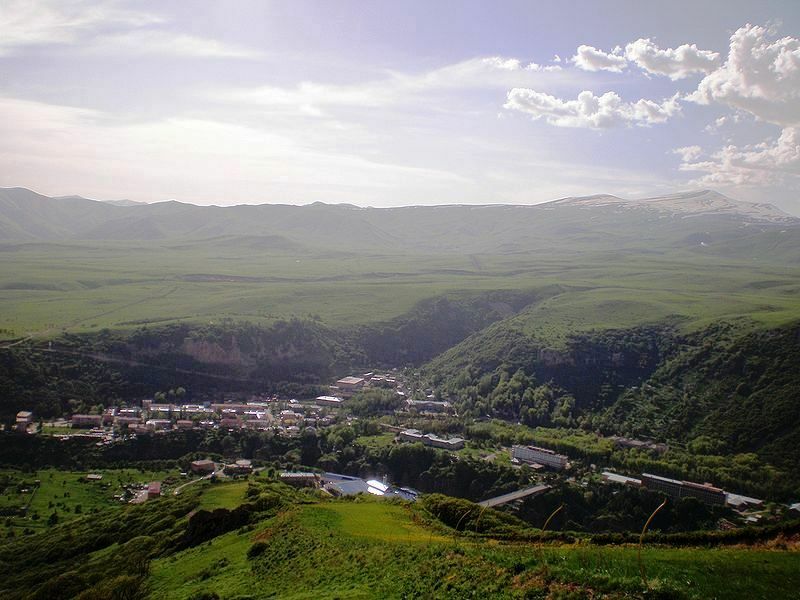 Vayots Dzor is also home to the popular spa-town of Jermuk. Literally meaning “the valley of sorrows”, it is named after the Vayots Dzor canton of the historic Syunik province of Ancient Armenia, ruled by the Siunia dynasty. Situated at the southeastern end of modern-day Armenia, Vayots Dzor covers an area of 2,308 km² (7.8% of total area of Armenia).. It is the most sparsely populated province in the country. It borders the Nakhichevanexclave of Azerbaijan form the west and the Shahumyan Region of the Nagorno-Karabakh Republic from the east. Domestically, it is bordered by the Gegharkunik Province from the north, Ararat Province from the northwest and Syunik Province from the southeast. 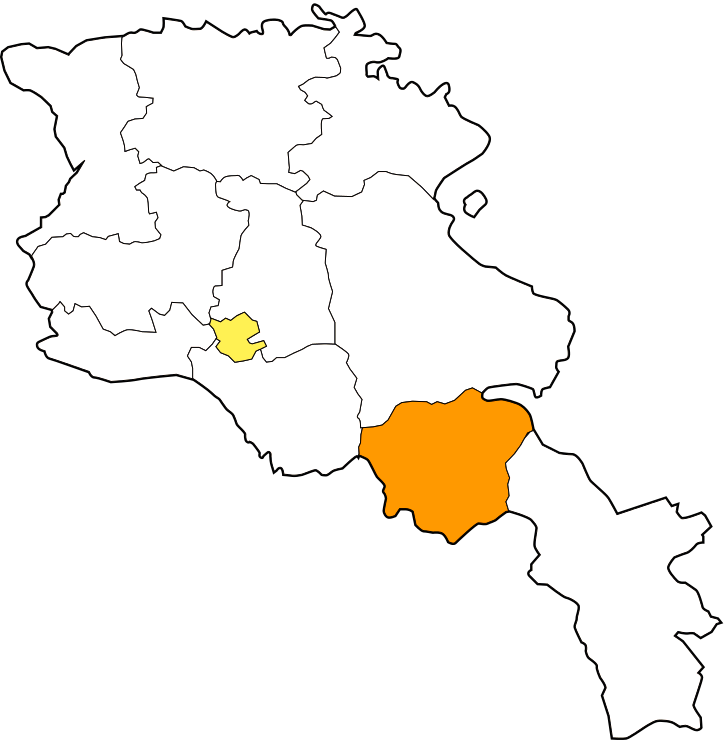 Historically, the current territory of the province occupies most of the Vayots Dzor canton of the historic Syunikprovince of Ancient Armenia. Vayots dzor is rich with rivers, mountains springs and mineral water. Arpa river has the most significant of them. It flows 92 km in the territory of Vayots Dzor. It originates in Vayots Dzor from the northwest hillside of Syunik plateau at a height of 3260 meters, and flows into the Araks river. It has lots of tributaries that form waterfalls such as the Jermuk Waterfall and the Herher waterfall. Yeghegis river is the main tributary of Arpa. It flows into a picturesque valley that is protected by the government as a wildlife sanctuary. Most of the rivers in Vayots Dzor are characterized with swift flow, deep fall and inclination. A huge project was fulfilled during the Soviet period, to transfer the water of Arpa river to Lake Sevan. Thus, an underground water tunnel was opened in 1981 that starts from the basin of Kechut reservoir to transfer the flow of Arpa river into lake Sevan. Many small lakes are also found in the valley of Herher river. Vayots Dzor was first mentioned in the Armenian history by Movses Khorenatsi. However, during archaeological excavations, many sites and objects were found in the region dating back to the Paleolithic Era and the Bronze Age. Many carvings on cliffs depicting scenes of hunting and animals were also found. As a result of the archaeological studies, historians assumed that the region has been settled since prehistoric times. The Areni-1 cave complex -including the 6100 year-old Areni-1 winery- discovered in the archaeological excavations conducted between 2007 and 2011, revealed that the region was settled during the 5th millennium BC (Late Chalcolithic Age). The winery consists of fermentation vats, a wine press, storage jars, pottery sherds, and is believed to be the earliest known winery in history. As early as the 8th century BC, the area of modern-day Vayots Dzor was part of the Kingdom of Urartu. Later, it became part of theKingdom of Armenia forming the Vayots Dzor canton of the Syunik Province. 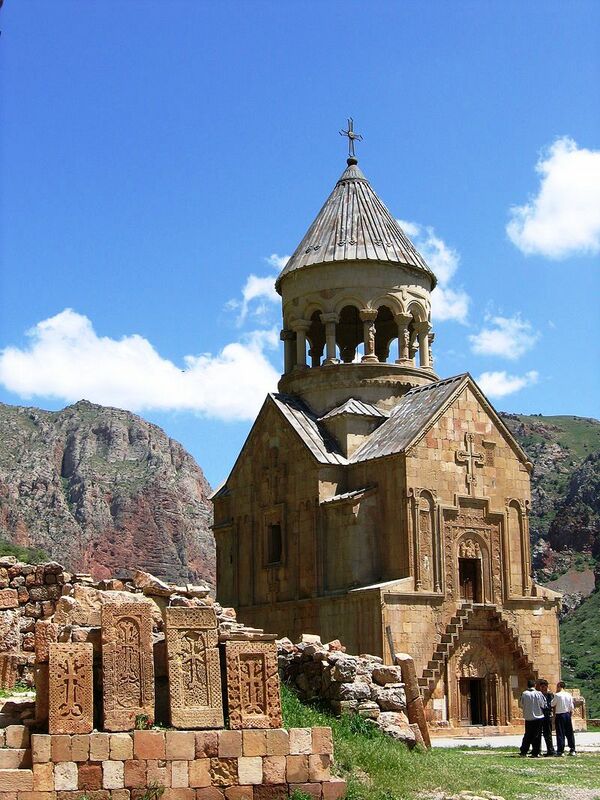 Many significant churches, monastic complexes, bridges andcaravanserais were built between the 10th and 13th centuries, when Vayots Dzor was part of the Kingdom of Syunik under the rule of theSiunia dynasty. In the Middle Ages, the Silk Road passed through the area of Vayots Dzor, particularly the road that currently links the town of Martuniwith Yeghegnadzor. The period between the 15th and 17th centuries is considered to be the darkest period in the history of Vayots Dzor. The region became a frequent battlefield between the invading troops of the Turkic and Iranian tribes. As a result, many significant monuments and prosperous villages were destroyed and the population was displaced. During the 1st half of the 19the century, Vayots Dzor became part of the Sharur-Daralagyoz uyezd of the Erivan Governorate of the Russian Empire. Between 1918 and 1920 it was included in the short-lived Republic of Armenia. After the Sovietization of Armenia, Vayots Dzor became one of the regions that resisted against the Soviet rule becoming part of the unrecognized Republic of Mountainous Armenia under the leadership of Garegin Nzhdeh. However, after falling to the Bolsheviks in July 1921, Vayots Dzor was included within the Armenian SSR. 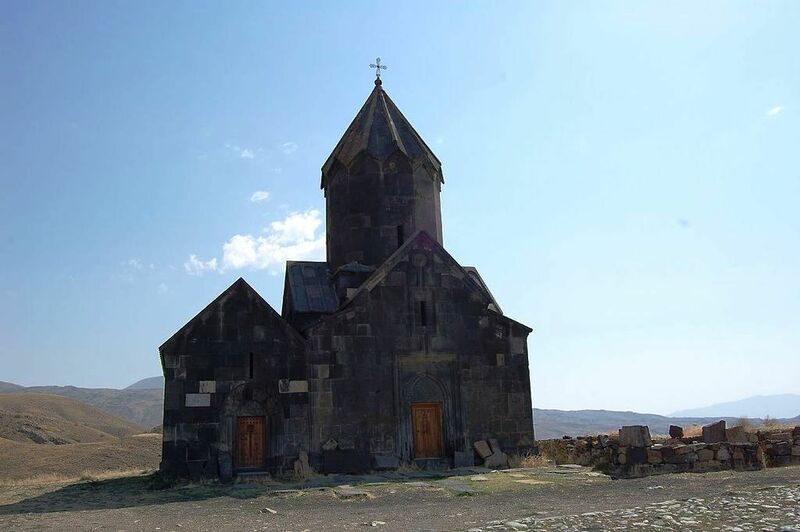 A significant number of the population in Vayots Dzor have their ancestors migrated form the Iranian towns of Salmas and Khoy in 1829 and 1830. The people of Vayots Dzor are mainly conservative. They largely celebrate the religious and traditional feasts, including Trndez andVardavar. The most popular celebration is the harvest festival, that is celebrated every year in Yeghegnadzor on the second Sunday of October. Locals from all villages take part in the parade on cars decorated with flowers, bringing their own crops, berries typical to their territories. Theatrical shows and concerts are being held during the festival. The other popular celebration in the province is the Wine festival which is celebrated in October in the village of Areni. In the villages of Vayots Dzor, traditional Armenian lavash and gata are still baked in traditional tandoors. popular dishes include sour banjar, kyalaglosh, shorva with ghavurma, rabbit kofta, portridge shorva, rosted quail and kid barbecue. People in Vayots Dzor are very hospitable and hardworking. The industry of Vayots Dzor contributes by 1% in the annual total industrial product of Armenia. Industry is mainly based on alcoholic beverages production, food-processing and dairy products. The discovery of the 6100 year-old Areni-1 winery has provided greater idea about the ancient tradition of wine-making in Armenia and particularly in the region of ancient Syunik. Vayots Dzor has a large number of wine producers (mainly producing under the category of “Areni wine”), including: “Areni” wine factory and “Hin Areni Vinyards” factory, both located in the village of Areni, “Vayk Group” company (produces wine, vodka and dried fruits) in Vayk, “Trinity Canyon Vineyards” company in the village of Aghavnadzor, “Zorah Wines” factory in the village of Rind, “Ginetas” wine factory in the village of Arpi, “Ginekar” wine factory in Aghavnadzor, “Getnatoun” wine factory in Yeghegnadzor, and “Arpa Alco” wine factory in Areni. Yeghegnadzor has many plants for cheese and other dairy prodcuts. It is also home to a small plant for electrical devices manufacturing. The town of Jermuk is famous for its mineral water production. The main water producers of Jermuk are the Jermuk Mineral Water Factory founded in 1951 and the Jermuk Group company founded in 1999. The cultural heritage and the natural monuments of the region attract a large number of tourists. Jermuk and the surrounding forests are a major tourist attraction with many luxurious sanatoriums, spa resorts and its ropeway. It is considered the centre of medical tourism in Armenia. Many areas of the province are listed as wildlife sanctuaries including the Herher Open Woodland Sanctuary, the Jermuk Forest Sanctuary, the Jermuk Hydrological Sanctuary, and the Yeghegnadzor Sanctuary.